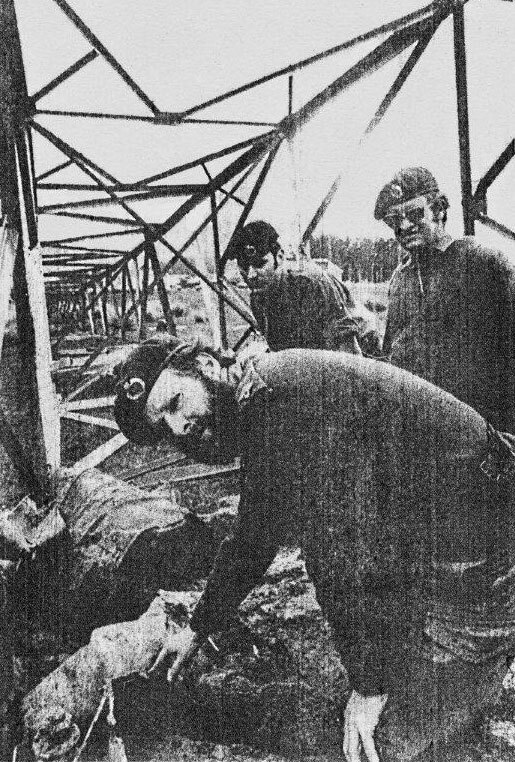 Second Lieutenant WF Thomson points to the jagged edges left at the base of one of the two Awarua radio masts demolished by the use of explosives on Saturday afternoon. The remains of sandbags and drums of sand lie strewn around the site, installed as a safety measure from flying shrapnel. The use of high explosives to demolish two Awarua radio masts on Saturday proved a magnet to members of the news media, who almost outnumbered curious onlookers. The short, sharp explosions which neatly toppled the two 150ft masts was witnessed more often than not through view-finders. Caution was the keyword for spectators and everyone collected at a safe distance from the masts, in a shallow gully in a grove of pine trees. Many believed that standing as near as possible to a tree, but not actually behind it would give some degree of protection. In fact, the trees afforded more protection from a biting cold wind that had people huddling about in little groups waiting while the army went through its 101 checks before the five kilograms of explosive was electrically detonated. Fifteen territorial soldiers from the No. 2 Engineers Troop, 3rd Field Squadron, Dunedin did all the leg work taking much of the morning. Their job consisted mainly of erecting sandbags and drums full of sand around each leg of the masts to shield onlookers and nearby houses the shrapnel. With typical precision, the job went off without a hitch and the masts fell almost into their allotted position. It was a strictly controlled fall, two of the mast supports being blasted a few seconds earlier than the other two. During the short duration of the blasts, four in total, traffic was stopped on the Invercargill to Bluff road and aircraft were warned to stay away from the area. Originally scheduled for 1:30 p.m., the explosions were delayed for 10 minutes until Awarua had finished transmitting a message. 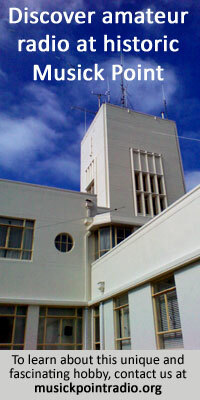 The two masts were erected in 1941 to carry the main marine aerial with the 500 kHz or distress frequency. Time and corrosion had made them unsafe and although condemned five years ago, they were still in full use up until last Thursday. They are to be replaced immediately by two new 150ft masts that are self-supporting and much more slender than the old ones. Editor’s note: The final sentence of the newspaper report is incorrect. The old towers were self-supporting, but the new towers would be guyed.